"Uncle, I don't think you should lie anymore." A Prelude to War marks a turning point for the I, Dolores series, in that the situation is no longer quite the same adventure for the Links family. As the disc begins, their long journey to get to Mars is ending and, in the process, they also discover there is much more to their quest than they originally had expected. While initially, the first obstacle to confront them is simply getting on Mars in the first place, they later learn that Mars' secret orbital frames development project is after them. We've known this for awhile, but the level of what it meant wasn't quite understood. Now, however, we see the connections between previous episodes, the earlier Idola movie, and even ties to the original video game. Dolores may have the mind of a child, but her value to Mars is almost impossible to comprehend, especially since Mars plans a secret war of independence against Earth. Disturbingly enough, though, it would appear the greatest foes to the Links family are children, those trained and used by the government to pilot their own orbital frames. At first, James Links thinks he can have everything under control by simply moving slowly and hiding as much as possible, but this soon proves to a be a plan he can't complete. Dolores is simply too much of a target, and her human, childlike brain makes it more difficult, as she lacks the logic of a true, battle-hardened A.I. The eventual fate of the Martian revolution and the quest for Rachel Links (James' wife and the mother of his children) is totally unknown. While the show keeps its characteristic level of humor and creativity, there is still a creeping seriousness that is now emerging in the show. The time for gallant defiance of space authorities is starting to end and, instead, the Links family is discovering the dark situation on Mars and how the government, in its quest to defy Earth, is becoming almost as bad as Earth. Another plot issue made more prominent in this volume is the fact that Dolores was, at one time, known to the Mars government as "Isis," their most prized orbital frame project. Exactly how the robot became transformed into Dolores is completely unknown, but even more mysterious is the fact that her genuine personality and intelligence is unheard of in robot technology. In a sense, the arrival on Mars was touted as a beginning to the end of I, Dolores, but it seems even more questions are popping up about what is going on. There is also the introduction of a new member of the Links family party; a particularly nosy and shallow Earth reporter, who believes that the plight of Mars people is worth some good snapshots and bylines. The new mixture of elements provides a whole new setting for what will presumably be the final moments of the series. As we approach this moment in the show, the strength of the writing and characterizations is still top-notch. Despite the introduction of many new things, there is still a grounded center that manages to stabilize everything. Unfortunately, a stage is set for immense tragedy as well, which is a path that the writers could easily turn down. It would be unfortunate, I think, to make I, Dolores too depressing and dark, but yet, it almost seems that it might be the only way the series can go. 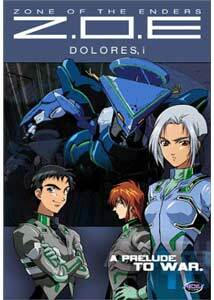 Either way, Zone of the Enders is powerful and entertaining, and tells an epic of a family saga. Volume 4 cannot come soon enough. Image Transfer Review: The footage is, as usual, extremely clear and unaffected by any source problems or transfer issues. While there is some dot-crawl effects in the sharper sequences, overall, you get an amazingly crisp image that comes directly from the animators. The show is very colorful and brilliant, and all this comes through easily. Audio Transfer Review: The audio doesn't have many surround effects, but in general the powerful work comes through quite well. There is strong music work and perfect use of intense sound work for the action sequences and more upbeat parts. Everything is handled in the most fitting way possible. Extras Review: The most interesting feature on the disc is footage of a dubbing session from one of the episodes on the disc. Featured are actors Hoko Kuwashima and Tesshou Genda, who play Dolores and James, respectively. After some of the footage is an interview with Kuwashima in which she talks about her experience performing as Dolores and motivations behind the character. Like the "Dolores' Diary" promos on previous discs, there is also a "James' Diary" feature, which serves as a promotional peek at the episodes as seen through the eyes of James Links. A detailed map of the Mars of the future is also provided, with locations names and other important landmarks. The usual galleries of artwork are presented, but the clean opening/closing reels are a little different this time in that they are designed like karaoke, with sing-along lyrics. The excitement continues as I, Dolores sets itself up for the final volume. The fate of the Links family is wrapped in mystery, and it's the kind of mystery you really want to get into; still one of the best anime series out there. Check it out.